“In the New Year, our hopes and prayers are with the millions of people who are suffering terribly from oppressive governments in North Korea, Venezuela, Cuba, and especially in Iran, where the long-repressed Iranian people are now finding their voice,” Haley stated. “The Iranian government is being tested by its own citizens. We pray that freedom and human rights will carry the day,” she continued. “We support the right of the Iranian people to express themselves peacefully. Their voices deserve to be heard. We encourage all parties to protect this fundamental right to peaceful expression and to avoid any actions that contribute to censorship,” White House Press Secretary Sarah Huckabee Sanders said yesterday. “In the events of last night, unfortunately, a total of about 10 people were killed in several cities,” Iranian state television reported this morning. The official total was revised upward to 12 dead later on Monday morning. It’s hard to tell exactly what is happening in the Islamic state of Iran. The mullahs have now cut off Internet access and social media and are controlling the media with an iron fist. I am all but certain the twelve that are dead were executed by the military there. Although you will hear that they were criminals, looters or fired at police first. Guns are prohibited in Iran, so take that for what it is worth, which is a whole lot of nothing. 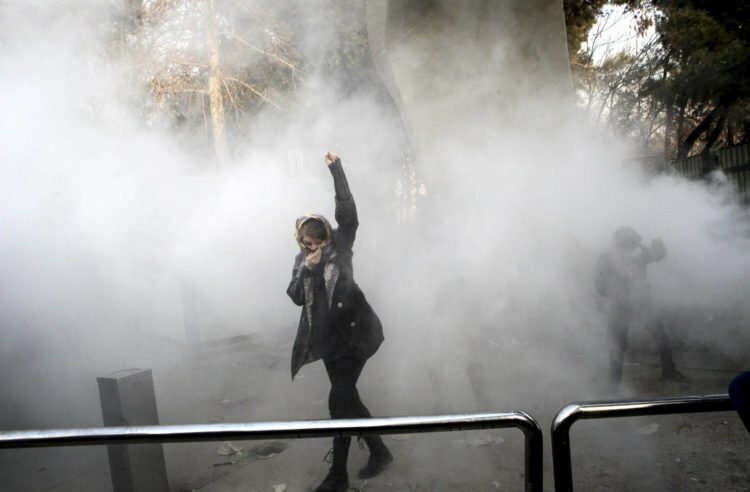 Rand Corporation senior policy analyst Alireza Nader cited unconfirmed reports on Sunday evening that protesters have “taken over government offices in the city of Tehran and is fighting security forces. Hard to tell, but there seems to be significant fighting all over Iran,” Nader added, alluding to the difficulty of obtaining reliable information from inside the Islamic Republic. “The government will show no tolerance for those who damage public properties, violate public order and create unrest in the society,” Iranian President Hassan Rouhani warned, possibly portending a massive crackdown to come. Rouhani declared that Iran is a “free nation” and conceded that “according to the constitution and citizen rights, the people are free to express their criticism and even their protests.” However, he stressed that “criticism should not be accompanied by violence or vandalizing public property.” What a joke all of this is. You know that people will be tortured and executed over what they are calling ‘freedom’. Rouhani also took a swipe at President Trump in his comments, “This man in America who is sympathizing today with our people has forgotten that he called the Iranian nation terrorists a few months ago. This man who is against the Iranian nation to his core has no right to sympathize with Iranians.” Trump is sympathizing with the people of Iran, not their radical, terrorist leaders and he knows it. The government in Iran also shut down the schools and offices in Tehran and other cities, supposedly due to “air pollution” alerts. Right… although they have shut schools down for smog alerts before, color me highly skeptical on the timing of this one. The mainstream media this weekend appeared to support the Iranian government more than the people there. So did the left. Instead CNN covered pro-government demonstrations that were staged. This is surely in support of Obama’s phony deal with Iran. It’s beyond reprehensible. They don’t give air time to the chants of “Death to Rouhani!” The media tried to spin all of this as economic unrest and anger at corruption until it became way too obvious that they are protesting against the suppression of radical Islam and the Ayatollahs. Per Breitbart, as an example, demonstrators in Khorramabad chanted, “We are Iranians, we don’t accept Arabs!” That’s a slam against the mullahs – they’re saying Islamic theocracy is a system imported from the Arabs and imposed on what used to be the Persian Empire. Another way to translate this slogan is, “We are Aryans! We don’t worship the Arab God!” They also set fire to a government headquarters building. Protesters are incensed that the money Obama gave Iran has been used to build their military and advance terrorism and war. Meanwhile, Iranians suffer in want and need. Hudson Institute President Kenneth Weinstein has an excellent suggestion: “As protesters in Iran chant ‘we live like paupers as they live like princes,’ the U.S. government should release details on the billions in stolen assets held personally by regime and Iranian Islamic Revolutionary Guard Corps officials and the Supreme Leader.” There is little we can do for these people short of a bloody war… but we can encourage them to turn on the theocracy strangling their nation.